A company called Texas Instruments recently presented its latest gadget - a tablet called Blaze. The company's new device includes a 1GHz OMAP4 chip, which is meant to increase software compatibility. 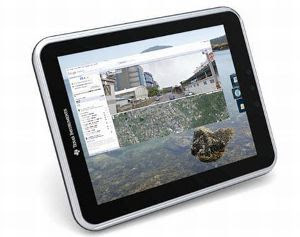 The tablet boasts a 10.4-inch XVGA LCD multitouch display, with a 1024 x 768 resolution that features a cellular modem, WLAN, Bluetooth, GPS and FM connectivity. There's also HDMI, SD card and USB ports for connectivity. In addition, the Blaze tablet has multiple external camera modules and an external DLP pico-projector. You may also find 1GB RAM and 32GB flash memory. It is worth mentioning that the tablet includes an accelerometer and gyroscope to provide an unforgettable gaming experience. If you want to be the owner of one of such tablets you will need to wait until August. Currently the company did not provide any details regarding the pricing.